L’Shana Tovah. Happy New Year 5777. May you be written and inscribed for a very happy, sweet, and healthy new year. For those curious about Jewish customs at this time: There are a number of things you will see. The first is an abundance of sweet foods. Apples dipped in honey. Honey cakes. The sweet foods remind us of the sweet year to come. Apples in honey, specifically, express our hopes for a sweet and fruitful year. Apples were selected because in ancient times they became a symbol of the Jewish people in relationship to God. In Song of Songs, we read, “As the apple is rare and unique among the trees of the forest, so is my beloved [Israel] amongst the maidens [nations] of the world.” In medieval times, writes Patti Shosteck in A Lexicon of Jewish Cooking, apples were considered so special that individuals would use a sharp utensil or their nails to hand-carve their personal hopes and prayers into the apple skins before they were eaten. 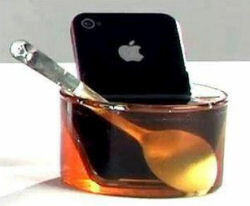 And the Zohar, a 13th-century Jewish mystical text, states that beauty – represented by God – “diffuses itself in the world as an apple.” With respect to the honey: honey – whether from dates, figs, or apiaries – was the most prevalent sweetener in the Jewish world and was the most available “sweet” for dipping purposes. And as for the biblical description of Israel as a land flowing with “milk and honey,” the Torah is alluding to a paste made from overripe dates, not honey from beehives. Still, enjoying honey at Rosh HaShanah reminds us of our historic connection with the Holy Land. Although the tradition is not in the Torah or Talmud, even as early as the 7th century, it was customary to wish someone, “Shana Tova Umetukah” (A Good and Sweet Year). Another traditional food is a round challah. Some say they it represents a crown that reflects our coronating God as the Ruler of the world. Others suggest that the circular shape points to the cyclical nature of the year. The Hebrew word for year is “shana,” which comes from the Hebrew word “repeat.” Perhaps the circle illustrates how the years just go round and round. 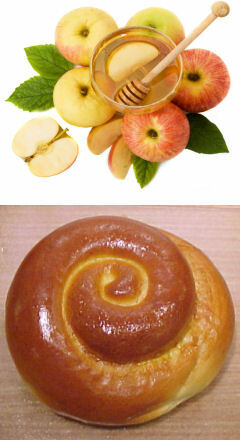 But Rosh Hashana challahs are not really circles; they are spirals… The word “shana” has a double meaning as well. In addition to “repeat,” it also means “change”. As the year goes go round and round, repeating the same seasons and holidays as the year before, we are presented with a choice: Do we want this shana (year) to be a repetition, or do we want to make a change (shinui)? Hopefully, each year we make choices for change that are positive, and each year we will climb higher and higher, creating a spiritual spiral. The shape of the Rosh Hashana challah reminds us that this is the time of year to make those decisions. This is the time to engage in the creative spiritual process that lifts us out of the repetitive cycle, and directs our energies toward a higher end. There are also apologies, for during the ten days starting Sunday evening, Jews examine their lives and see how they can do better. On Yom Kippur (starting the evening of October 11th), Jews apologize to G-d for their misdeeds during the past year. However, for an action against another person, one must apologize to that person. If I have offended any of you, in any way, shape, manner, or form, real or imagined, then I apologize and beg forgiveness. If I have done anything to hurt, demean, or otherwise injure you, I apologize and beg forgiveness. If I have done or said over the past year that has upset, or otherwise bothered you, I sincerely apologize, and will do my best to ensure it won’t happen again. If you have done something in the above categories, don’t worry. I know it wasn’t intentional, and I would accept any apology you would make. May all my blog readers and all my friends have a very happy, healthy, and meaningful new year. May you find in this year what you need to find in life.